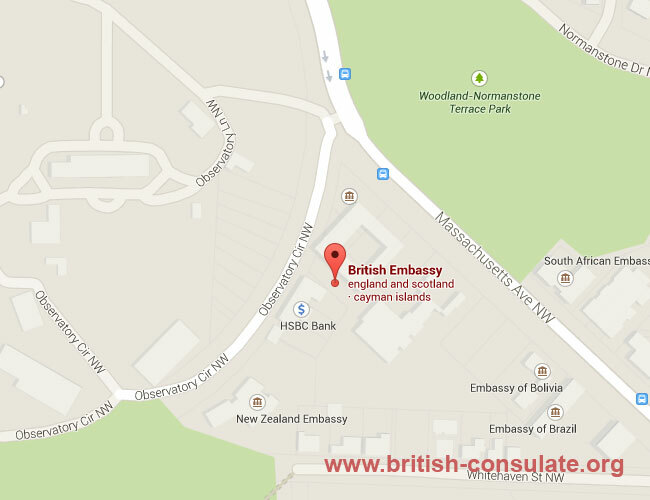 The British Embassy in Washington, US is located close to the New Zealand Embassy in Washington. We have now listed all their contact telephone numbers which is below on this webpage. You will also note that the British Embassy in Washington can now also issue a British visa and we have listed their visa timelines below. Also note that other consular services can be given to you and your family as a British national(s) such as marriage registration and also applying for a new British passport or simply renewing your British passport in Washington. Before you visit the British Embassy ensure that you call them or email them first to ensure that they are open. The operating hours of the British Embassy in Washington is listed below. Note that there are also a number of British Consulates in the United States. These are the British Consulate in Atlanta, the British Consulate in Boston, then also the British Consulate in Chicago and the British Consulate in Denver. Last but not least would the the British Consulate in Houston, the British Consulate in Miami and the British Consulate in New York also note that there is a British consulate in San Francisco and a British Consulate in Los Angeles. British Consulate General Atlanta – The British Consulate General in Atlanta represents the UK government in Alabama, Georgia, Mississippi, North Carolina, South Carolina, and Tennessee. British Consulate General Boston – The British Consulate General in Boston represents the UK government in the New England region. British Consulate General Chicago – The British Consulate General in Chicago represents the UK government in 13 states across the upper Midwest of the United States. British Consulate General Denver – The British Consulate General in Denver represents the UK government in Colorado, New Mexico and Wyoming. British Consulate General Houston – The British Consulate General in Houston represents the UK government in Texas, Louisiana, Arkansas and Oklahoma. British Consulate General Miami – The British Consulate General in Miami represents the UK government in Florida, Puerto Rico and the US Virgin Islands. British Consulate General New York – The British Consulate General in New York City represents the UK government in New York, New Jersey, Pennsylvania, and Fairfield County in Connecticut. British Consulate General San Francisco – The British Consulate General in San Francisco represents the UK government in northern California, Oregon, Washington, Alaska, Idaho and Montana. British Consulate General Los Angeles – The British Consulate General in Los Angeles represents the UK government in southern California, Nevada, Arizona, Hawaii, Utah, Guam and American Samoa.